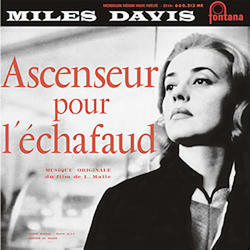 Jean-Paul Rappeneau, a Jazz fan and Louis Malle's assistant at the time, suggested asking Miles Davis to create the film's soundtrack. A private screening had been organized. On December 4 1957, Miles Davis brought three French Jazzmen - Barney Wilen on tenor saxophone, René Urtreger on piano, Pierre Michelot on bass and his American compatriot Kenny Clarke on drums - to the recording studio Le Poste Parisien without having them prepare anything. Miles Davis only gave the musicians a few rudimentary harmonic sequences he had assembled in his hotel room. This recording was made at night in a most informal atmosphere.